Metaplace now allows embedding in Web-pages, and even in blog posts. 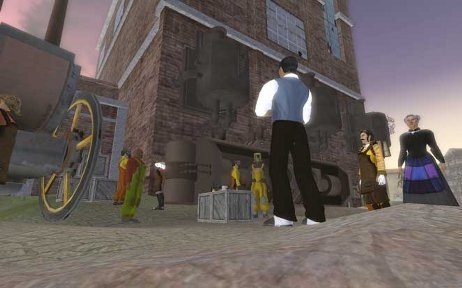 Check out Dalian Hansen’s Steampunk world in Metaplace after the fold. If Atlus’ NeoSteam isn’t steampunky enough for you, you might be interested to know that Gatheryn, the upcoming casual steampunk MMORPG from Mindfuse is signing up beta-testers. During the beta-test period, you’ll be expected to keep your lips zipped about the game itself, while various systems are added and tuned, of course. Signing up isn’t a guarantee that you’ll get in on the beta, but failing to sign up is a guarantee that you won’t. Let me run up at that phrase again. A steampunk machines/cogs/steam/puzzle game on Valve’s Steam for Windows. There’s also a demo. Tricky, kinda cool, steampunk and relatively cheap. What’s not to like? It’s called Cogs, and you should try the demo before making any purchasing decisions. Maybe it’s not for you.